Download a free Halloween safety poster. Halloween can be a fun time for kids and adults alike, but it's also a holiday fraught with potential safety hazards. Use a fun safety poster to remind kids and parents to stay safe while enjoying the festivities. Trick-or-treating is a time-honored Halloween tradition. It's fun to go door-to-door in costume and ask for treats, and it's a task that can be done safely when certain guidelines are followed. 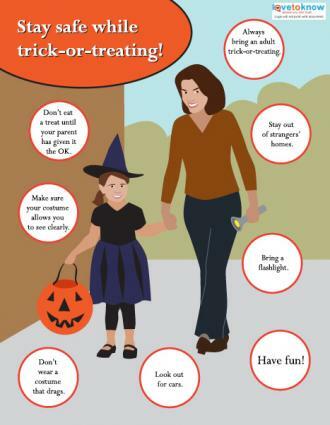 The Halloween safety poster above is easy to download and provides quick tips for safe trick-or-treating. If you need help downloading the poster, check out these helpful tips. Adults: Kids shouldn't trick-or-treat without an adult joining them. Even older kids should have an adult keeping an eye on them, even if they do so from a bit of a distance. Treats: An adult should look through treats before kids are allowed to eat them. This process lets the adult discard any suspicious items or treats that appeared to have been tampered with. Homes: Well-meaning adults might beckon trick-or-treaters inside their homes to get warm or to check out the treat selection, but not all people have the best intentions. Kids should never go into the home of a stranger while trick-or-treating. Mask: Masks should be easy to see through. If a mask obstructs the child's view, she may not notice tripping hazards or oncoming traffic. Costume: Costumes shouldn't drag along on the ground. Not only is this a tripping hazard, it could also be a potential fire hazard if the loose material touches a lit jack-o-lantern. Flashlight: Adults should carry a flashlight and kids can carry glow sticks. This helps everyone see where they are going while also making them more visible to cars. Traffic: Not all drivers realize that excited children are roaming the neighborhood at night on Halloween. Take care to pay special attention to traffic and obey crosswalks and streetlights while trick-or-treating. Fun: The last reminder on the poster is to have fun! Trick-or-treating can be a great time when safety rules are followed, and there are some great activities to help your kids learn how to protect themselves. Additional Halloween safety posters are available online, ranging from posters designed for young kids to posters intended for parents. The United States Consumer Safety Commission offers a Halloween safety poster that is available in both English and Spanish. The Minnesota Safety Council provides a poster filled with quick tips for safe trick-or-treating. All Natural Pet Care designed a Halloween safety poster for sharing on social media that reminds pet owners to bring their animals inside on Halloween night. Halloween might be known as a night filled with mischief, but that doesn't mean it has to also be a night filled with injuries. Use a safety poster to remind kids to stay safe while reminding parents of the best ways to enjoy the occasion safely.